Vapor Slide 2 in 1 Review - Combining the Pleasures of two Into One! We tested the Vapor Slide 2 in 1, and we never thought such an interesting device would ever exist. This small vaporizer pen is also compatible with most standard water pipes. It features a button-free design with a pressure sensor technology that automatically starts when drawing. Read our review to find out more about these wonderful features! When we first saw the Vapor Slide, it looked to us like a regular small size vape pen with its 5.5-inch (in height) by 2-inch (in width) size. We liked the device quality. The body is made of aluminum and is solid. It feels right when held in hand, the shape settles nicely and smoothly in the palm. Regarding design, it looks quite obviously like a device, especially with the silver mouthpiece end. However, it can still offer discreteness when you hold it in hand and close it, it becomes fully hidden, and only the mouthpiece is sticking out. So it is still possible to vape in full discretion. 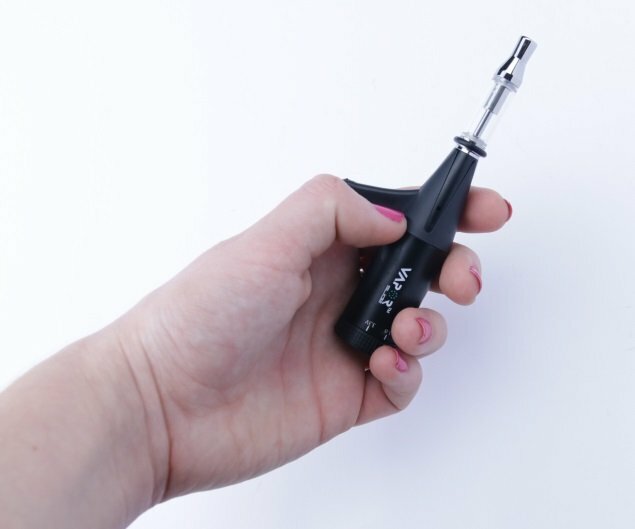 The Vapor Slide 2 in 1 is small, easy to use, and can last for several weeks with a single oil cartridge. To our opinion, this is a strong advantage if you are taking a few days trip, like a road trip, or to the mountains. Ideal! Nothing is perfect, unfortunately. We did not like the handle on the side of the device. It is bothersome when holding the device in hand, but also when we had it in our shirt or trousers pocket especially. The Vapor Slide fits oils but will not work with thick concentrates like wax or with dry herbs. There is a cartridge that you can fill yourself. Once done, you can use this as a portable vape pen or slide it into a water pipe. Moreover, it is compatible with the majority of water pipes. It is easy to use because there are no buttons on the device! You will not need to press any button to turn it on or off anymore, and the heat activates whenever you start drawing – it starts producing vapor immediately. Also, the device switches off automatically after 10 seconds. How to fill your Vapor Slide? Loading and reloading the tank can be a little tricky and may be time-consuming especially if you used cannabis oil. However, no worries Vapor Slide has a one-on-one video tutorial on how to fill the tank with your favorite oils. All you need is a toothpick and patients. We found the 1000mAh battery life excellent, and we were delighted with it. It works very well on all the temperature levels. It can last for a few days before having to recharge it. Obviously, the battery life closely depends on how often you will use it, and with which power level. The Vapor Slide 2 n 1 has an awesome button-free design with brand new airflow and pressure sensor technologies, which activate the pen without pressing any button at all. How amazing is that? You only need to place the e-liquid or oil in the tank, put the pen into the water pipe joint and start drawing from the waterpipe mouthpiece. The device will start automatically and produce an amazing vapor at each single hit. We never tried anything easier than the Vapor Slide. Seriously, all you have to do is take a draw! There are no buttons to use, only a knob to switch for temperature, And the device gets activated by airflow. That is all it takes. Moreover, the fact that a single oil cartridge can hold several weeks makes it a dream vaporizer to have. We were extremely satisfied with the vapor quality, but to be honest, when we discovered such fantastic features, we expected no less than great vapor quality. On the highest temperatures, we felt the vapor could get a bit harsh. Some of us are experienced users and loved their vapor strong, and others did not. However, when we used it like a water pipe, the harshness disappeared thanks to the water in the filtration. So it felt more enjoyable, the vapor smoothened and had a nice cooling off sensation. The Vapor Slide is made from aircraft aluminum and has a strong 1000mAh rechargeable battery with a pass-through feature to allow you to charge and vape at the same time. We loved the twistable voltage knob on the device. It has a specific LED light to indicate each voltage range from 3.3 to 4.8 volts. We were able to increase or decrease the amount of vapor produced. Amazing. We wanted to compare the Vapor Slide with another similar device, the Yocan Torch. Their overall build quality is good. They are easy to use; however, the Vapor Slide is more discreet. The Torch works with any glass water pipe. If you prefer using your own, but look for a device that can deliver a controlled temperature, then the Yocan is for you. The Torch bottom has a connector designed to fit any glass water pipe. Also, once it is on your rig or water pipe, you simply fill in your wax in the atomizer and close it. We think that the Yocan Torch lacks temperatures flexibility. The device only delivers low-temperature dabs; however, it manages to offer excellent flavors and good clouds full of flavor and smooth draws. To our opinion, this is the biggest downside when the Vapor Slide offers a choice of six temperature levels. Our Conclusion: Get the Vapor Slide! We have to admit that we took great pleasure trying the Vapor Slide 2 in 1. It is something truly unique and very efficient. We loved the fact that the Vapor Slide is able to produce thick and tasty clouds, while the water pipe uses water to add a filtration layer and make it cleaner. The main functionality is vape pen, and it comes with two top coil tanks, one to use as an “on-the-go sesh” and the other one for water pipe vaping. The Water pipe functionality is designed to fit and easily slide into any standard water pipe joint. 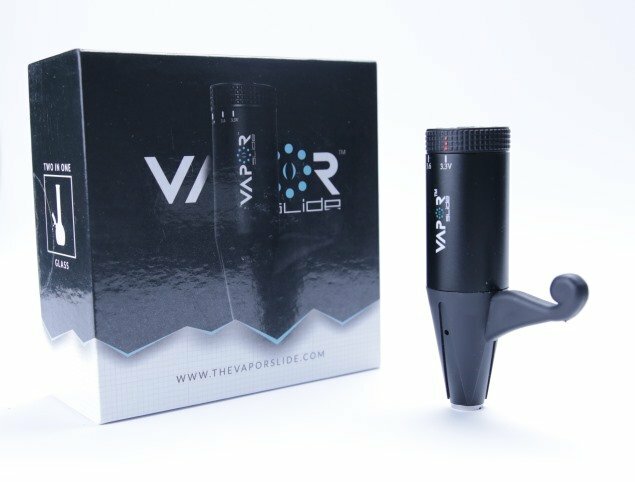 Once in place, you just need to start inhaling since the Vapor Slide will activate automatically, thanks to the pressure sensor technology built-in. What a great technology! Adding that the 1000mAh rechargeable battery can be charged via USB cable, while in use. Overall, we had a great time with the device, and could easily navigate through the different settings to find your ideal temperature for oils and e-liquids. 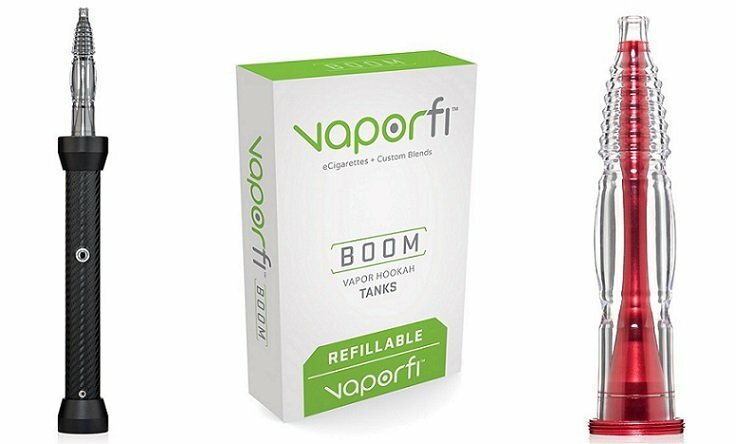 This features guarantees an amazing vapor production. We have to admit that we had a great time trying on the Vapor Slide 2 in 1, what an experience! The vape pen gave us plenty of satisfaction; it offers a quality vapor, which can be strong at times. However, then, switching to water pipe mode increased the purity level of the smoke, so it felt like cooling off. Our experience was quite fascinating, and we were amazed discovering each single of these unique functions. Also, what surprised us the most was to see such functionalities fitting such a small and discreet device. A device we strongly recommend getting, especially those looking for strong and quality vapor, but also for the water pipe amateurs. The Vaporesso Drizzle is the newest vape mod from Vaporesso that includes its EUC core, which saves both money and time. Read our review here. VaporFi’s Boom is the company’s answer to users’ calls for a portable hookah. Does the reduced size mean reduced performance? Read on to find out. The information on this site is not intended or implied to be a substitute for professional medical advice, diagnosis or treatment. There is absolutely no assurance that any statement contained or cited in an article touching on medical matters is true, correct, precise, or up-to-date. The overwhelming majority of such articles are written, in part or in whole, by nonprofessionals. WARNING: The content of this website is for informational purposes only and not to be considered as medical advice. E-cigarettes are not approved by the FDA as a quit smoking aid. The products we review on this website, as well as the information provided, are intended for use by responsible adults over the age of 18 (or the legal tobacco possession age in your area). © VapingDaily, All Rights Reserved.